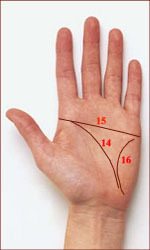 Palmistry & Palm reading: 16 Gift markings in your hands! 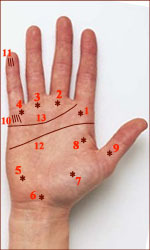 How to recognize ‘gift markings’ in your hands? The full article includes a full list of the 16 ‘Gift markers’ + a summary of interesting comments on these presented by the expert Hand Analysts: Pamelah Landers, Jena Griffiths, Peggie Arvidson and Baeth Davis.